Message Muffins was established by Maria, a farmers wife and mum of four children, with a simple mission - to make people smile! 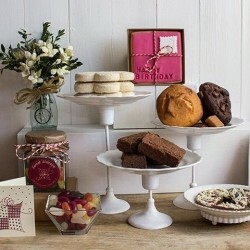 They have a range of scrumptious gifts, all made by hand to order. Each of their delightful hampers contains an array of tasty treats, wrapped and beautifully gift boxed with a greetings card and your personal message. Sending the perfect gift couldn't be easier.